Is Twitter Skimping on R&D? Twitter's investment in research and development is dropping fast. Is that welcome news for investors, or a sign of even tougher times ahead? Image source: Twitter Media Gallery. It wasn't that long ago that analysts were questioning whether Twitter (NYSE:TWTR) was spending too much on research and development. Today, the better question may be if the company is spending enough in that area. 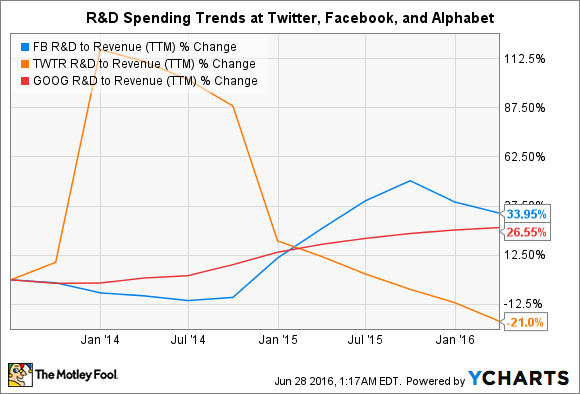 Two years ago, Twitter was directing more than 80% of its revenue into R&D expenses. While that seemed like a lot, the company's revenue growth kept critics at bay, more than doubling in 2014 compared to the prior year. Flash-forward to the most recent quarter, and R&D spending came in at 26% of revenue, less than a third of what it was two years earlier by that metric. Even more telling: In the most recent quarter, Twitter's R&D expenses were down 18% in actual dollars from the year-ago period. This is a level of R&D spending Twitter now seems comfortable with. Chief Financial Officer Anthony Noto noted on the latest earnings call that R&D expenses as a percentage of revenue were "where we would like them to be in the long term" to achieve its target margins. That may help to placate investors who are looking at Twitter and wondering when it's going to turn a profit. But the problem is that Twitter is falling behind other platforms and failing to differentiate itself in the digital advertising market. Revenue growth has slowed significantly, down from 111% in 2014 to 36% in the most recent quarter. What's more, evidence is mounting that more trouble lies ahead for Twitter. Marketers and ad executives are abandoning the platform in favor of its competitors. User growth has stalled. And Facebook (NASDAQ:FB), its chief competitor, is carving out a more dominant position in the market with each passing quarter. If you're Twitter, this hardly seems like the time to power down your investment in research and development. Businesses that make their money in digital advertising need to continually innovate to stay competitive. More than half of the market today is owned by just two companies: Facebook and Alphabet (NASDAQ:GOOG) (NASDAQ:GOOGL). Those two companies spent a combined $17.1 billion on research and development last fiscal year, and both are increasing their R&D spending. Alphabet's R&D spending was up 22% in the first quarter, while Facebook sank some 28% more into R&D than it did last year. FB R&D to Revenue (TTM) data by YCharts. Of course, it's less a matter of how much you spend on R&D as it is how much return you get from it. And on this front, Twitter executives seem to think the company is better off now than before. After what management referred to as an effort to "right-size the organization" last year, its efforts are now more focused on what it calls its "product roadmap." "We feel like we have the right organization behind that," Noto said. As a result, even though it has continued cutting R&D, it's now working on more software projects than it had been last year, Noto said. He also reminded analysts that Twitter's engineering and design team remains "very sizable." If Twitter is able to deliver better products through a more focused and considerably less costly R&D program, that's a win for the company and its investors. It would also be a strong sign that things are moving in the right direction at the social media company under Jack Dorsey. However, we've yet to see any compelling evidence that's the case. On the contrary, the evidence suggests that Twitter is falling further behind its competitors at a crucial time in the digital ad game. The company does not want to throw good money after bad, pouring dollars into research and development that isn't helping it to win over advertisers and establish more solid footing in the digital ad market. But it's concerning that Twitter has so quickly throttled its R&D expenses at a time when it's losing ground to Facebook and Google. If Noto is right, and the company is set to get a better return from a more focused R&D program, we should see the results in improved revenue and user growth. But if that doesn't materialize, investors should question whether Twitter looked to slash R&D as a way to save at a time when it could ill afford to do so.